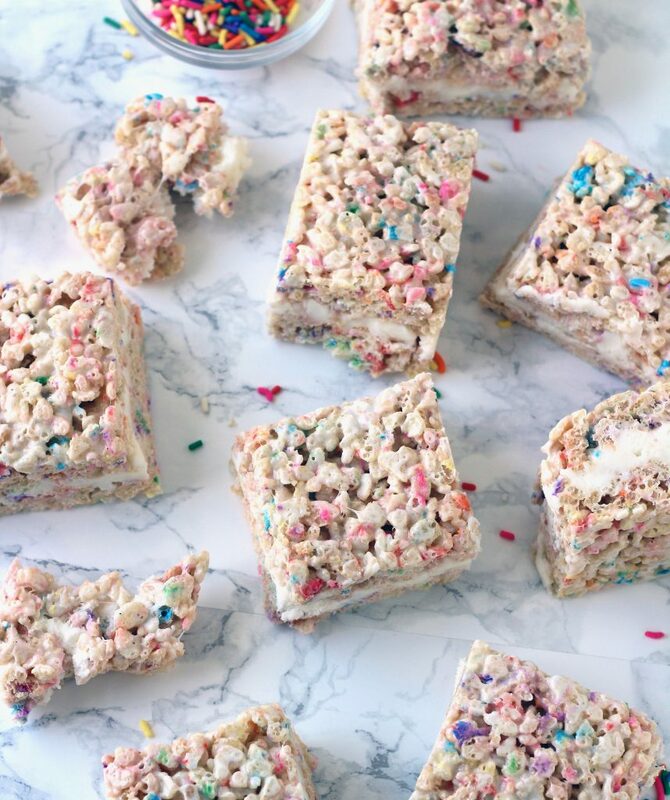 It’s Rice Krispie Treats meets birthday cake and it just doesn’t get any better. 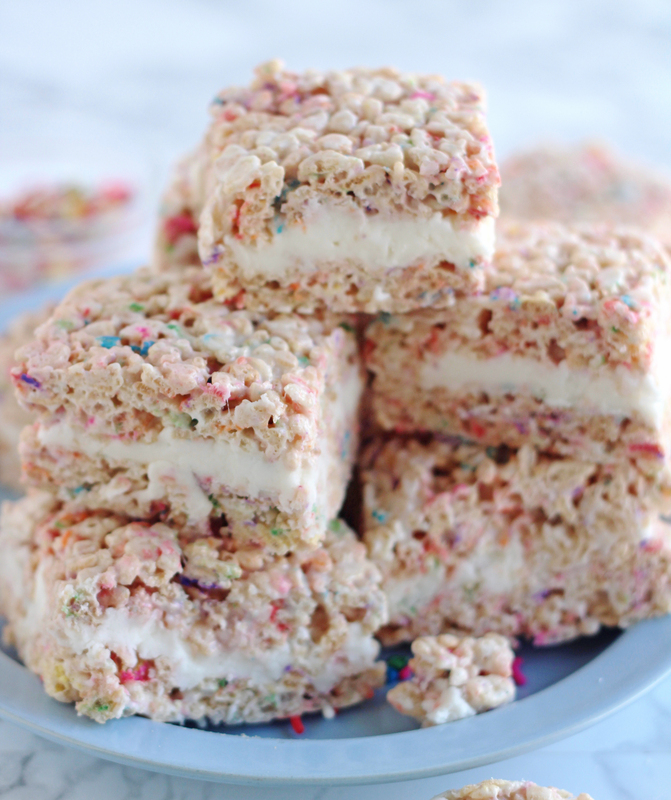 These Birthday Cake Rice Krispie Treats are ridiculously good. You won’t be able to eat just one! Rice Krispie Treats, I love them, buuuut only if they’re made right. By right I mean, they have to be soft & gooey, but not too soft and gooey, because then they’re mushy. And then there’s the hard and crunchy ones where the marshmallows mixture has been over cooked! Blah! Those kind could possibly send you to the dentist. Now take the perfectly soft and gooey Rice Krispie treat and toss in a little funfetti cake mix and sprinkles and holy moly you’ve got an insanely good treat! I literally made these three times in one week and every single time I had to give half of them away. They’re addicting! (And yes, my boys would 100% back me on the statement). My boys went bonkers over these little treats. The people I shared these with, probably cursed my name because like I said, they’re addicting and you can’t stop eating them. Simple to make, so dang cute to look at and ridiculously delicious to eat. Line a 10x15-inch jelly roll pan with foil and spray lightly with cooking spray, set aside. In a large pot, melt the butter over low heat. Add in the marshmallows and stir until they are just melted. Remove from heat and stir in the dry cake mix. Add the Rice Krispies and sprinkles, mix well. Press in the prepared pan and let cool. Cut the Rice Krispie layer in half, vertically (so you'll have two rectangles about 5 x 7 1/2-inches). Spread the buttercream filling evenly over half of the Rice Krispie layer. Place the other half on top of the frosting to make a giant "sandwich", pressing down lightly. Cut into bars. Store in an airtight container (if there's any left). A jelly roll pan is not quite as big as a large cookie sheet. If you only have the large cookie sheet, go ahead and use that, line it with foil and spray it, but when you press the Rice Krispie mixture into the pan, just don't press it all the way to fit the pan, leave about 2 to 3 inches on one end. These are worth every stinking calorie! If you love rice-krispie treats, these are a must! I just made the Birthday Cake Rice Krispy Treats and they are fantastic! I used the blue confetti cake and the color is gorgeous! What a great new twist on an old classic. Thank you! So happy to hear you loved them Amy. What a fun idea to use the blue confetti cake mix, I’ll have to try that. Thanks for letting me know they were a hit.